Screws and pins for fixation are not included in delivery ! The Everlast Speed Bag Kit is a classic training device for boxing training or combat sports. You can improve your punch ability and reactions with a speedball. 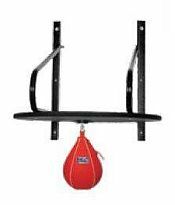 The Everlast Speed Bag Kit is delivered as complete set including a wooden platform, a high-quality speedball and a speedball mount - and it is optimal for starting boxing workout !